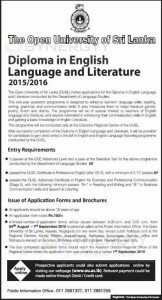 The Open University of Sri Lanka [OUSL] invites applications for the Diploma in English Language and Literature conducted by the Department of Language Studies. This one-year academic programme is designed to enhance learners’ language skills: reading, writing, grammar, and communication skills. It also introduces them to major literature genres poetry, fiction and drama. The programme will be of special interest to learners of English language and literature, and anyone interested in enhancing: their communication skills in English and gaining a basic knowledge of English Literature. This Programme will be conducted only at the Colombo Regional Centre of the OUSL. After successful completion of the Diploma n English Language and Literature, it will be possible for candidates to gain direct entry to the BA in English and English Language Teaching programme conducted by the OUSL. Passed the OUSL Advanced Certificate In English for Business and Professional Communication (Stage ii). With the following minimum passes: B+ Reading and Writing and B- in Business Communication skills and Speech & Listening. Prospective applicants could also submit applications online by visiting our webpage (www.ou.iclk). Relevant payment could be made online through Debit / Credit card.